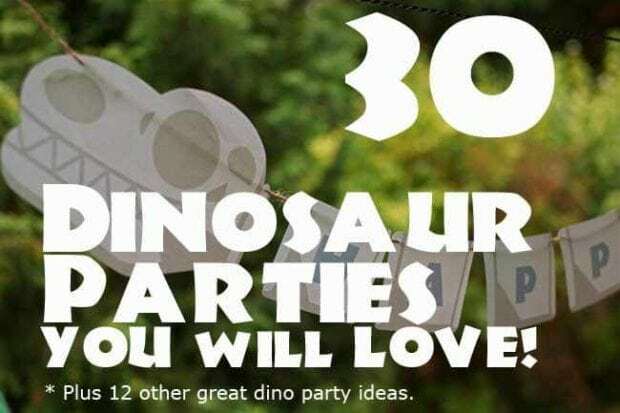 These dinosaur themed birthday party ideas are a little boy’s dream come true! The theme for this fourth birthday party — planned by Pure Joy Events — starts with the great “Dinosaur Roar” invitation from the Sassy Photo Creations Etsy shop. It’s then carried throughout the party with a bright red and aqua blue color scheme, and of course dinosaurs. I love the pop of the Happy Birthday banner and red chairs against the dark wood at the party table. The bright green table cloth also lends a natural feel to the party theme. These Dinosaur Plate Craft idea is a perfect addition to your next dinosaur themed birthday party table. These Kid’s Party Food: Dinosaur Bones are super east to make and will be a hit with little ones. I also adore the handmade t-rex table toppers. Each piece was cut out and assembled by the birthday boy’s dad just for the occasion. The blow up t-rex character in the yard is also a great touch. For this party, there was lots of natural foods served. Guests enjoyed fresh fruit as well as sandwiches with pterodactyl-shaped cheese! I think that’s a great touch and a simple, creative way to bring the theme to the food table. After a refreshing lunch, guests were treated to gourmet chocolate, vanilla, and red velvet cupcakes. My favorite part of the cupcakes are the absolutely darling fondant dinosaurs created for the toppers. Aren’t they just the cutest things?! I’m sure adults and kids alike had a hard time resisting them. They also added handmade paper cut like grass to the cupcake tower for an added touch. As a farewell at the end of the party, guests each picked a cookie pop from Sugar Cookie Creations to take home and enjoy. I think it’s great that they were able to keep the theme colors on each of the treats that they served. Now, this might be my favorite part of the party. What little boy doesn’t love to dig in the dirt?! After treats were finished, the kids headed off for a dinosaur fossil dig. How CUTE is that! Plus, kids are able to keep the fossils they dig up so it’s an easy way to give the kids party favors. Each child received their own bucket, customized with their name and a digging tool. Finally, guests enjoyed their own personal tour of “Jurassic” with a ride on the four wheeler. I think the custom sign on the back of the four wheeler is great, especially since it keeps with the color theme for the party.